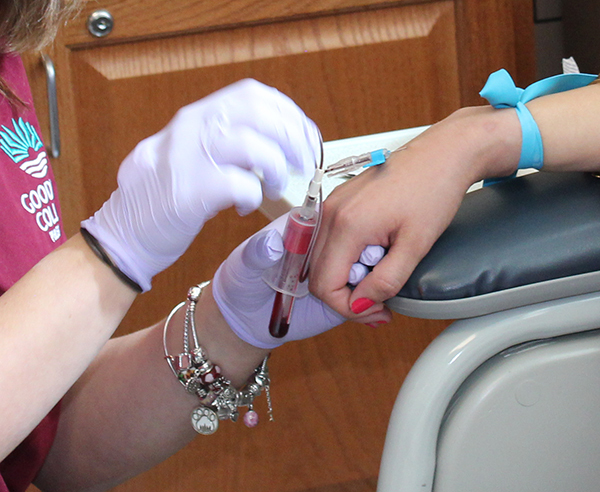 When Goodwin College students graduate from the semester-long Phlebotomy program, offered three times a year, they earn a 16-credit collegiate certificate. The certificate allows them to enter the workforce immediately, and gives them 16 college credits that are fully transferable towards other degree programs at Goodwin. The graduates are eligible to sit for a voluntary certification exam. This additional certification is not mandatory for employment in many states, including Connecticut, but employers look upon it favorably. Students are commonly compensated for their certification with a higher hourly wage. St. Francis Hospital, for example, pays an extra $2/hr for the certification. Following the 2015 spring semester, eight graduates of the Phlebotomy program elected to take the certification exam to give themselves an edge over their competition for jobs. All eight students passed. Previously, taking this exam required manually signing up for a test date and traveling to an independent test center. For the last two semesters, thanks to the program’s recent partnership with the National Healthcareer Association, sitting for this exam has become much more accessible. Ava Hill, the Practicum Coordinator of the Phlebotomy program, attributes some of the students’ success to the accessibility of the NHA exam, which is held on the Goodwin campus. 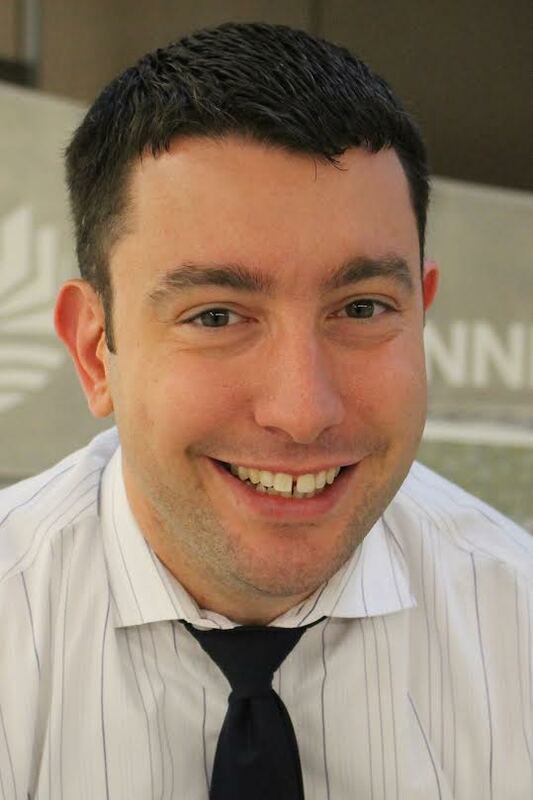 “The advantages of having the exam at Goodwin are tremendous. It encourages students to follow through and actually take the exam, and it means the graduates all support each other,” said Hill. She also espoused the values of having the eight graduates take the exam at the same time. “Even though they had already graduated from the program, they still called each other to remind everyone about the exam,” she explained. Paula Dowd, the Department Chair of Health and Natural Sciences, agreed that location is a key factor. “When students have to go to a different exam site, transportation can sometimes be an impediment. When they can take the exam at Goodwin, they’re used to the layout—it’s just one less stressor,” she said. Dowd was confident that the Phlebotomy students were set up to succeed. “One of the reasons all eight students passed is that our instructors work in the field, and we offer enhancements in addition to instruction, like shadowing Red Cross workers at the Goodwin blood drive,” Dowd mentioned. Students can also practice live sticks on Goodwin faculty and staff volunteers. “The content of our courses as well as these enhancements really position students for success in the exam, giving them the necessary critical thinking skills and practice,” Dowd said. Moving forward, the Health and Natural Sciences department is making the exam even more affordable and accessible to their students. Currently, students pay a $105 fee to sit for the exam. For upcoming semesters, the department plans to roll this exam fee into the students’ financial aid packages. “I am really excited about this partnership with the NHA. 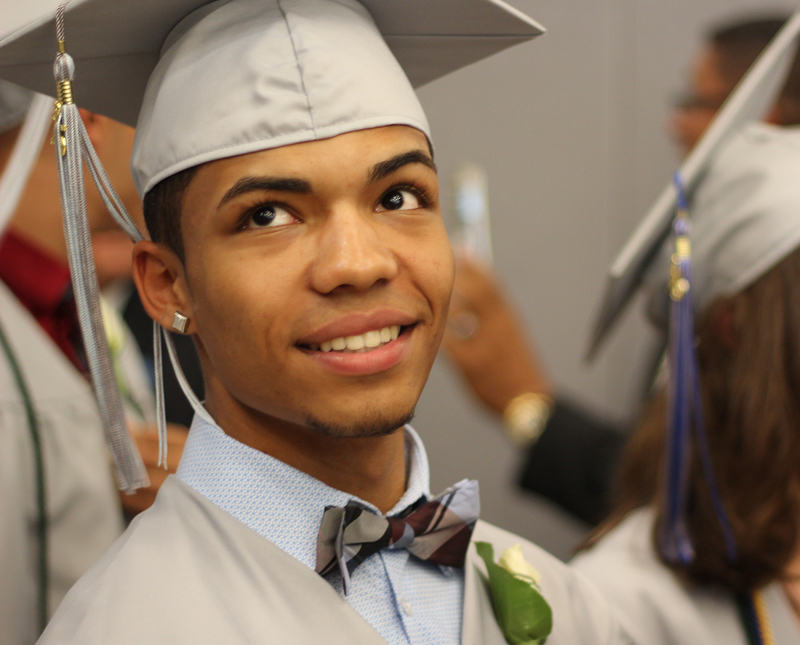 They make certification accessible for our students,” said Dowd. For more information on the Goodwin Phlebotomy program, visit http://www.goodwin.edu/majors/phlebotomy/. In his remarks to the Connecticut River Academy (CTRA) Class of 2015, Goodwin College president Mark Scheinberg referred to the ceremony as a “night of dreams.” “The land where your school sits today was once brownfields with oil tanks. You started out at CTRA in the Sandbox,” he said, referring to the small modular classrooms that originally housed the students until their new four-story building on the banks of the Connecticut River opened in 2014. Any dream is possible, he added, once you find out the “why” of your life. Assistant principal Tara Amatrudo has been named to succeed Dadona in the coming school year. Of the 80 graduates in this year’s CTRA class, 44 have already earned credits at Goodwin College, 21 have been inducted into the National Honor Society, and 11 have volunteered for 100 hours or more of service to the community. (left to right): Tyler Pereau, Easton Ronalter, Edward Jobes, Josh Hockley, Jack MacKay, and Jasmine Kermode. 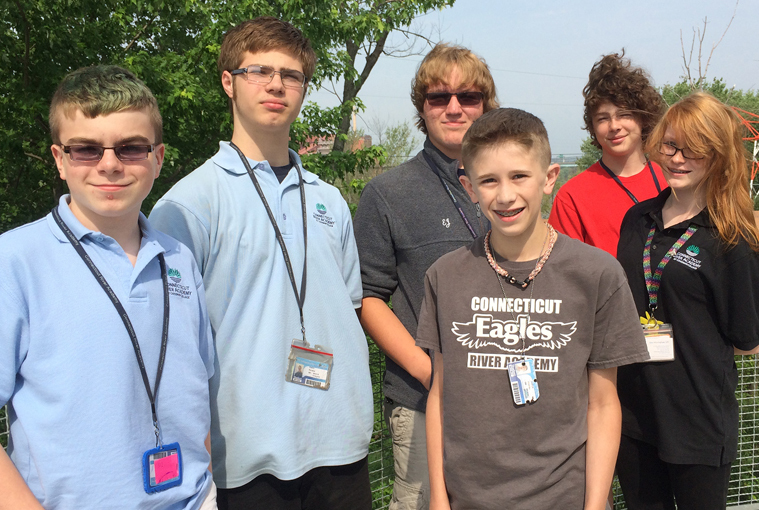 On May 22, the Connecticut River Academy (CTRA) Envirothon team competed against 41 other state high school teams at the Connecticut College Aboretum in New London. Envirothon, a natural resource based-education program for Connecticut high school students, promotes environmental awareness and personal stewardship through education and competition. Divisions in the competition include aquatics, forestry, soils, wildlife, oral presentation, and a skill station. The CTRA team tied for first place in the aquatics division and ranked thirteenth overall in their second year as a competing team. Coached by CTRA science staff member Sebby Agostino, the CTRA team met weekly to review curriculum materials, conduct fieldwork, and prepare a presentation. They also attended four Saturday workshops including one on aquatics hosted by CTRA in January. The competition team members included Jasmin Claudio, Edward Jobes, Jasmine Kermode, Jack MacKay, Tyler Pereau, and Easton Ronalter. Other team members are Kaitlyn Abbott, Blaise Bible, and Josh Hockley. Urban forestry was the topic for all oral presentations in this year’s statewide Envirothon competition, and CTRA’s tree study of the Goodwin College campus in East Hartford earned them a high ranking in that category. In preparation for Envirothon, the CTRA team hosted about 50 students for a “tree tour” during the school’s annual spring magnet theme day. To learn more about the Connecticut River Academy, please visit www.ctriveracademy.org. Goodwin College is planning to make a walk in the woods in East Hartford more accessible. Located in the midst of a highly urbanized community with limited open and green spaces, Goodwin College plans to expand on an existing and planned network of trails in the area known as the South Meadows in East Hartford, Wethersfield, and Glastonbury. Goodwin is hosting a meeting on June 23, 6 p.m., at its River Campus, 195 Riverside Drive, Room 206, East Hartford. All are invited to attend and learn more about the trails. Goodwin hopes to expand on a universal access trail development in progress, which will extend from the College to its Field Lab in the South Meadows, along the Connecticut River south to the Putnam Bridge in Glastonbury. The effort will build upon the existing network of trails along the CT River with possible connections to other trail networks in Wethersfield and Glastonbury. To assist with the planning and construction of the trail, Goodwin College is seeking a grant from the Connecticut Department of Energy and Environmental Protection Recreational Trails Program. At the meeting, area residents and organizations will have the opportunity to comment on the proposed trail. For information, please call Todd Andrews at 860-727-6791. College graduates are often urged to move beyond life’s challenges and to make a difference in the world. In addressing an estimated 440 fellow graduates and 3,000 faculty, family, and friends at Goodwin College’s June 6 Commencement, student speaker James Tillman moved the audience to silence when he issued a similar challenge, one that he had already embraced on a life-changing scale. Tillman spent more than 18 years in prison after being convicted of a crime he didn’t commit. And exactly nine years to the day after walking out of prison a free man—exonerated by new DNA evidence and the work of the Connecticut Innocence Project—he spoke before the Goodwin College Class of 2015 as their chosen student representative and the recipient of an associate degree in Human Services. Tillman wrote a book about his experience, The Power of Conviction: My Wrongful Conviction, 18 Years in Prison, and the Freedom Earned Through Forgiveness and Faith, a copy of which was given to each Goodwin graduate following the ceremony. That call to make a difference in the world was echoed by Civil Rights activist Bob Zellner, who received an honorary doctorate from the College. A noted activist and Freedom Rider, Zellner was mentored by Dr. Martin Luther King, helped call attention to Civil Rights issues in the Deep South, and is currently walking from North Carolina to Washington, D.C. to advocate for better health care in rural communities. 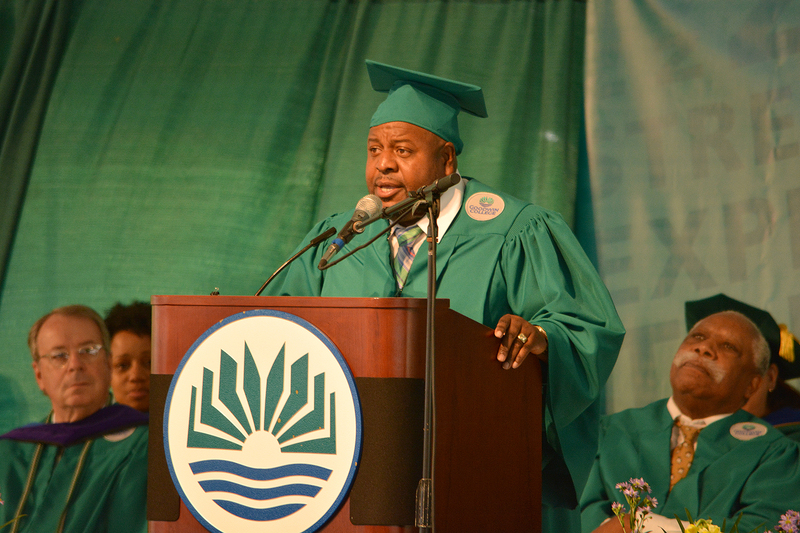 “Rise up and make a new nation,” Zellner urged the graduates. Joe Marfuggi, former president and CEO of Riverfront Recapture, Inc., also received an honorary doctorate and urged the graduates to work for a better future. “Why settle for the way things are when you can work to make things better?” he asked. Marfuggi worked for the Riverfront Recapture organization for more than 27 years, advocating tirelessly to increase public access to the Connecticut River. 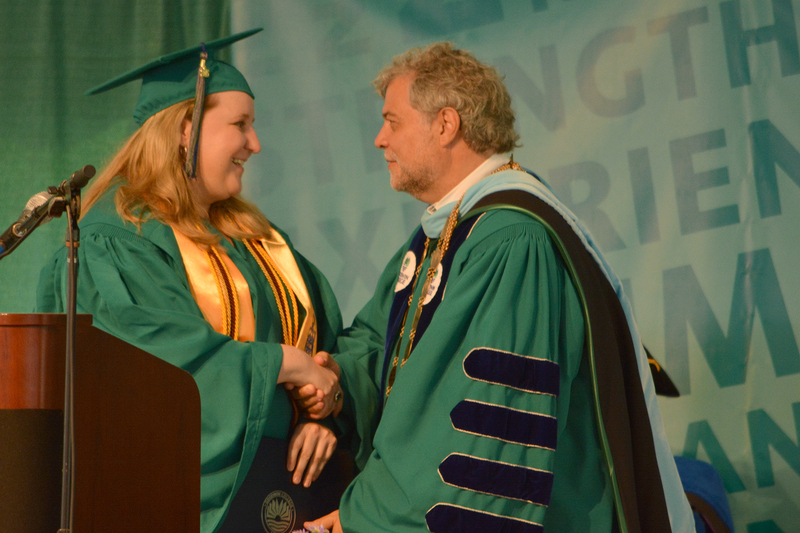 In echoing the thoughts of Robert F. Kennedy, Marfuggi congratulated the graduates on daring to ask, “Why not?” rather than just “Why?” and on doing the work to make themselves and their world better. In his remarks, Goodwin president Mark Scheinberg quoted Mark Twain, telling the students that the two most important days in people’s lives are the day they’re born and the day they find out why. “Today is the day you get to show the world your ‘Why,’” Scheinberg told the students. The Class of 2015 valedictorian, Lee Housley, who earned her bachelor’s degree in Business Administration, told the graduates that despite the many roads they had all taken in their lives, they were determined to keep walking in the right direction. 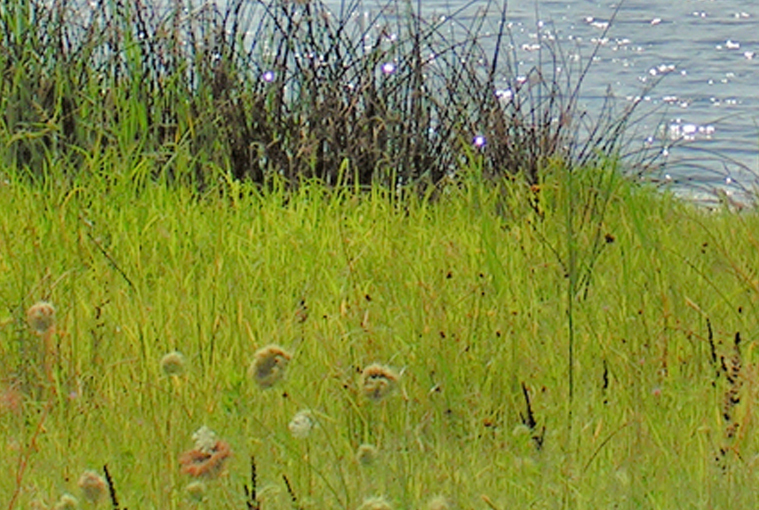 For the Connecticut River Academy (CTRA), an early college and environmentally-minded high school located on Goodwin College’s campus, innovative teaching styles and courses centered on community involvement are the norm. The high school, which supplies each of its students with a MacBook Air to provide access to the creative power of a personal computer, strives to constantly be at the cutting edge — and that effort is best reflected in the dedicated teaching staff. On May 29, the Connecticut River Academy named social studies teacher Tony Roy as the CTRA Teacher of the Year at their annual school celebration. Roy was a founding staff member of the school, and has been teaching there for five years. “It’s humbling. There are a lot of other great educators who work here, and I think it could have been anyone else because everyone works really hard here,” said Roy about the honor. Nominated for the award by his fellow teachers, Roy is known by students and teachers alike as a force to be reckoned with. He designed and taught curricula for classes like Civics, Food Systems, Social Justice, and Gender Studies, classes that have been wildly popular with students and often involve fieldwork along the Connecticut River. Roy also works to bring the community action and involvement outside of the classroom. Since CTRA’s founding five years ago, Roy has supervised the CTRA Activists. The club, Roy explained, focuses on helping the community as well as addressing social justice issues within the high school environment. As a group, they participated in statewide events like Rebuilding Together and the Walk Against Hunger for all five years. Last year, the school raised about $1,400 for the Walk Against Hunger and the club plans to continue the tradition. The club’s first event on the school campus was a Mix it Up at Lunch Day in 2010, where students were encouraged to sit with people they had never eaten lunch with before and make new friends. This style of diversifying the student population expanded into more serious issues like gender inequality in the student environment, which is explored through a program named GirlCott. The focus of GirlCott shifts every year — past topics have included the makeup industry to domestic violence — and culminates in a schoolwide assembly or show. Despite mentoring the club through all of these programs, Roy does not claim to be the driving force behind it. “I think my role is that of a coach, someone who is there for support and guidance and sometimes a little bit of boosting. I think that same kind of thing goes into my classroom as well,” Roy explained. He mentioned that this style of teaching is embraced by a growing number of teachers in Connecticut, not just those at CTRA. However, Roy explained that he did not think he could have achieved all of this on his own. He made sure to mention the other people he felt made his success possible, thanking them for their support. “Without my other colleagues in my department, who all worked together to build this great curriculum; without my wife, who is a major activist in this area and inspires me every day, this wouldn’t be possible,” he said. Goodwin College student Michele Gomez of East Hartford has been named a recipient of one of nine nursing scholarships awarded this year by the Wethersfield-Rocky Hill Professional Nurses Association (WRHPNA). 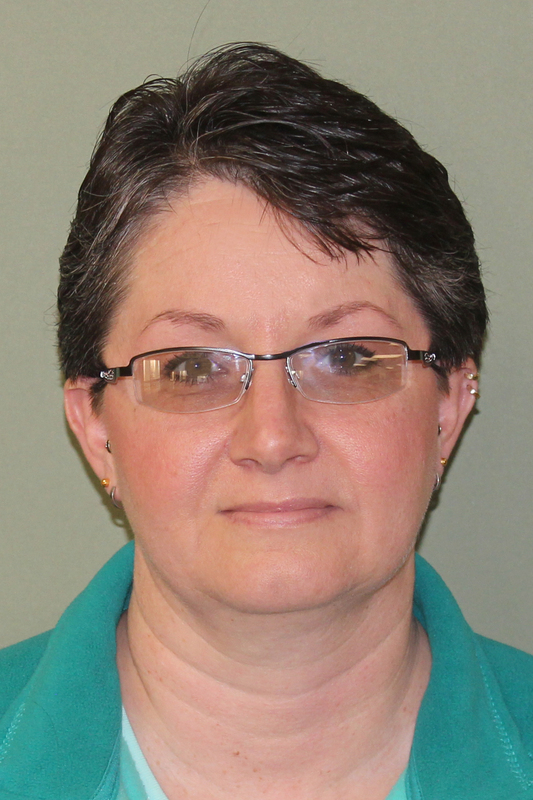 Michele is a registered nurse in the RN-to-BSN program at Goodwin and a staff nurse at ProHealth in Wallingford, CT. The announcement was made at the annual WRHPNA awards dinner on May 13. For nearly 75 years, the WRHPNA has been active in community service, including funding and awarding annual scholarships to support local and state residents preparing to become registered nurses, and current registered nurses planning to continue their education. 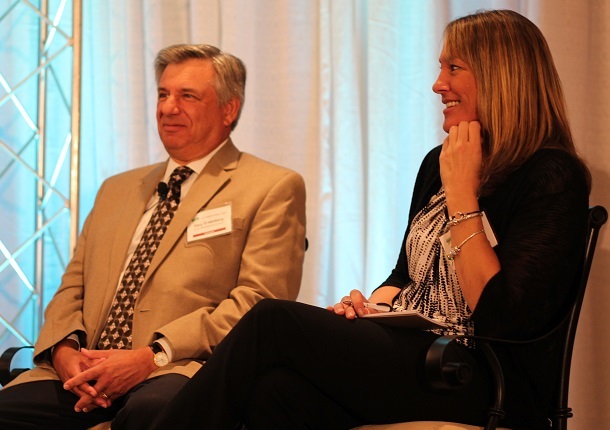 Karen Nozzolillo, a supply chain and logistics major at Goodwin College, spoke alongside other manufacturing students and industry presidents at the 2015 CBIA Manufacturing Summit on Friday, May 29. TRUMBULL – As part of a panel focused on the connections between education and industry, Goodwin College student and 20-year Birken Manufacturing veteran Karen Nozzolillo stressed the importance of the skills she continues to learn in school. The discussion was part of Made in Connecticut, the Connecticut Business & Industry Association’s 2015 summit, held in Trumbull on May 29. “I’m 46, going to school, and what I’ve learned I’m able to bring back and teach to other people in the company,” she told an assembled audience of dozens of manufacturing leaders, educators, and employees. Seated alongside Birken Manufacturing president Gary Greenberg and other industry panelists, Nozzolillo, spoke about her entry into the manufacturing field and how her Goodwin College education has helped determine the trajectory of her career. Nozzolillo has been employed at Birken Manufacturing since 1996, gaining on-the-job training in many facets of the business by handling front office responsibilities. Located in Bloomfield, Connecticut, Birken is a third-generation, privately held company that specializes in the manufacture and production of jet engine metal components and assemblies, with customers ranging from Pratt & Whitney to Rolls Royce. After taking a break of several years from Birken to raise her children and work full-time in emergency medical services, she returned to the company, where she has spent the past seven years in logistics. “She left being my assistant and became the head of logistics,” Greenberg said. She enrolled in Goodwin College in 2011 and majored in supply chain management in manufacturing. And thanks to her training in health and safety at Goodwin, she successfully lobbied to create the Environmental Health & Safety Officer position at Birken that she now occupies. 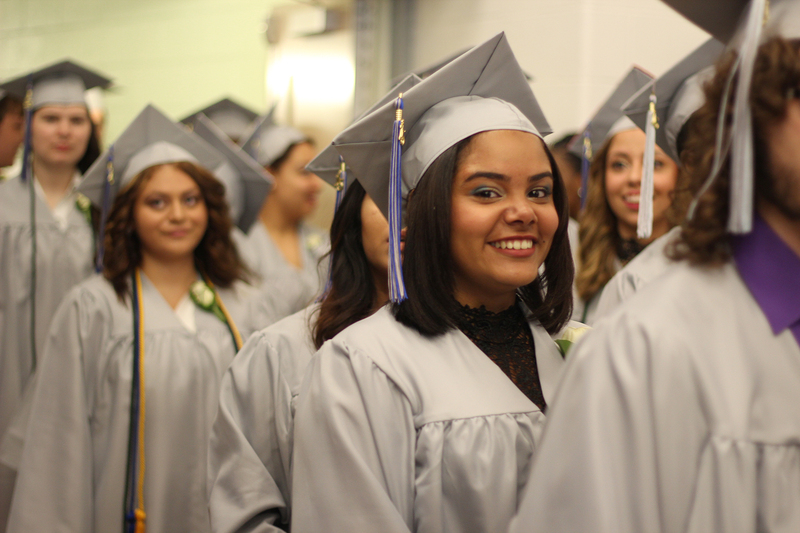 Nozzolillo continues to pursue her education at Goodwin College and plans to earn her bachelor’s degree. And when asked about the future, Nozzolillo laughed and pointed to Greenberg. Interprofessional collaboration is a partnership between a team of healthcare providers that allows for a synergistic influence of knowledge and skill to make decisions regarding health issues and improve patient outcomes. Goodwin’s nursing students and faculty along with the Occupational Therapy Assistant (OTA) students and faculty embarked on this collaboration. Jan Costello, Nursing Department Chair and Associate Professor, initiated the implementation. First semester nursing students and OTA students enrolled in Case Studies in Occupational Therapy worked together for four two-hour sessions. Teamwork and collaboration is a very important aspect of nursing education. It provides nursing students with the knowledge and expertise to move and position patients appropriately as well as provide them with assistive devices to facilitate optimum functioning and quality of life. OTA students learn the impact of specific medical conditions and gain insights into what type of interventions the patient may require. Through this educational collaboration, nursing and OTA students will be able to understand the cross over in their roles as a caretaker and transition into their professional life with that knowledge. “The bottom line is the quality of care and a greater appreciation of each team member’s role,” Anderson stated. Interprofessional collaboration will continue to be incorporated into Goodwin’s curriculum to equip students with the skills needed in the workforce.